Applications must be submitted online through the official website of the Commission after 'ONE TIME REGISTRATION'. Candidates who have already registered can apply through their profile. Note:- Those who are appointed in the post should serve for four (4) years during the first ten years of their service (including the period of training) anywhere in India or any other Foreign Country under defence Service or services connected with defence , if required. Those who have completed 45 years of age are exempted from the above Compulsory Military Service . Note:-Application submitted by candidates other than Dheevara community will be rejected. No rejection memo will be issued to them individually. 1 For persons who were in defence service, the first one year of their service will be treated as House Surgency. 2 Personnel working in various departments of Government and acquired MBBS qualification while in service will be given exemption, from upper age limit to the extent necessary for Direct Recruitment. The maximum age limit shall in no case exceed 50 years. 8. 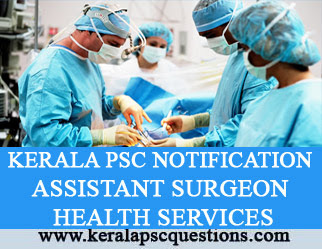 Mode of submitting Application:- Candidates must register as per ‘ONE TIME REGISTRATION’ with the official Website of Kerala Public Service Commission viz www.keralapsc.gov.inbefore applying for the post. Candidates who have registered can apply by logging on to their profile using their User-ID and password. Candidates must click on the ‘Apply Now’ button of the respective posts in the Notification Link to applying for a post. No application fee is required. Candidates can view and have a printout of the details in the profile by clicking the link Registration Card. Candidates are responsible for the correctness of the personal information and secrecy of password. Before the final submission of the application on the profile candidates must ensure correctness of the information on their profile. They must quote the User-ID for further communication with the Commission. Application submitted is provisional and cannot be deleted or altered after submission. The application will be summarily rejected if noncompliance with the notification is found in due course of processing. Documents to prove qualification, Experience, Community, age etc have to be produced as and when called for. 9. Last date for receipt of application:- 31.07.2013, Wednesday upto 12.00 Midnight.